My group work on many aspects of the adaptive radiation of tropical Heliconius butterflies, including evolutionary developmental biology of wing patterning, the genetic and behavioural basis for speciation, the sensory ecology of mimicry and analysis of the Heliconius melpomene genome. 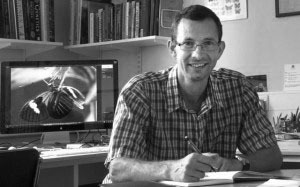 I have been working with Heliconius since 1993, when I started my PhD with Jim Mallet in University College London. During my PhD work I studied a hybrid zone in Ecuador between two incipient species (Heliconius himera and H. erato). My Postdoc work was mainly in Panama, where I showed that Heliconius melpomene and H. cydno use wing patterns as cues during mating, leading to reproductive isolation – an example of an ecological trait that contributes to assortative mating and a phenomenon that is now commonly termed a ‘magic trait’. We have since identified and studied genes underlying wing pattern diversification. We have also published the genome of Heliconius melpomene and in particular have focussed genomic studies on the patterns of admixture between species, work that raises fundamental questions about the nature of species identity.